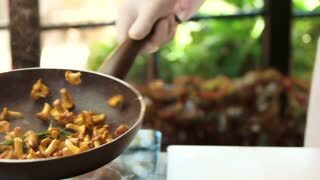 Flipping food in frying pan. 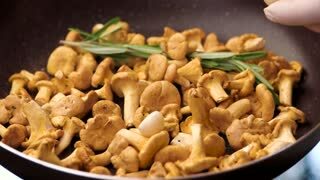 Chanterelles with rosemary and garlic. Easy mushroom recipes for dinner. 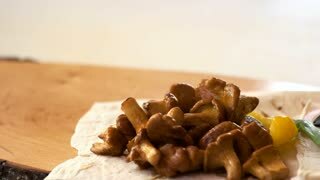 Pile of roasted chanterelles. Mushrooms and lavash. Vegetarian snack recipe. 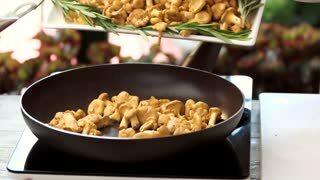 Chanterelles in a pan. Mushrooms with garlic and rosemary. 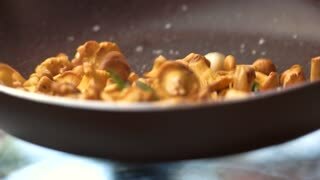 Mushrooms frying in slow-mo. 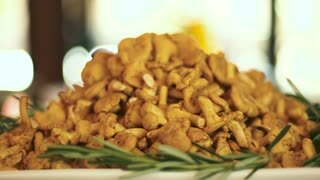 Chanterelles and herb. Frying pan in slow-mo. 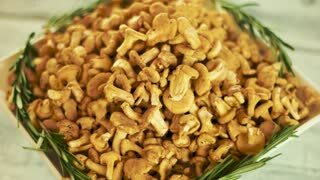 Chanterelles with spices. Easy mushroom recipes. Frying pan with chanterelles. Mushrooms and herb. Best cooking tips. Mushrooms are falling in slow-mo. 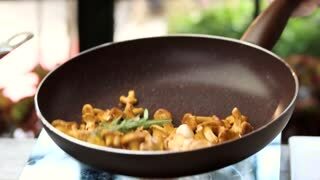 Golden chanterelles in frying pan. Autumn food recipes. 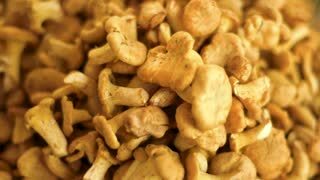 Pile of chanterelles close-up. Little yellow mushrooms. Pile of chanterelles on plate. Raw mushrooms and rosemary. Ingredient of French soup. Plate with chanterelles pile. Raw mushrooms and rosemary leaf. Best ingredients for French soup. Pile of chanterelles. Yellow mushrooms close-up. Woman picking chanterelles in the woods during autumn. Chanterelles and wild strawberries in front of a cast iron pan on a campfire in a forest in Sweden. 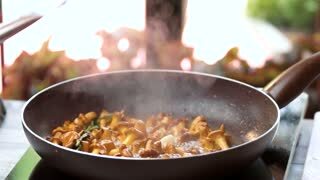 Chanterelles frying in a pan over open fire. cooked the chanterelles in the dish. Serving food. Chanterelles Mushroom quiche will be served for dinner.